That was California Democratic Rep. Eric Swalwell’s reaction to Maine Republican Sen. Susan Collins saying she had received threats meant to influence her vote on Supreme Court nominee Brett Kavanaugh. 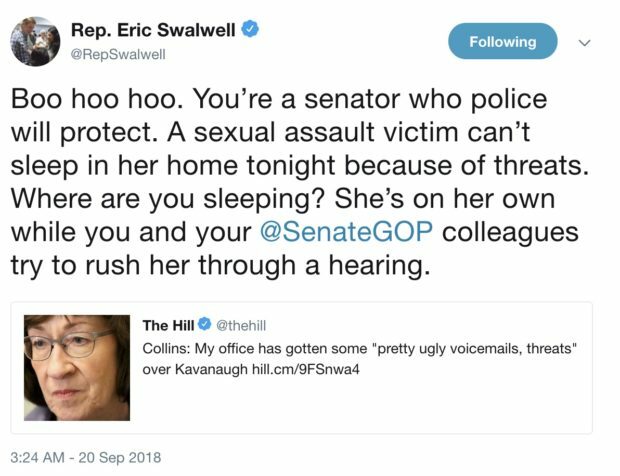 Swalwell deleted his tweet mocking Collins after facing online backlash. This article was updated to include Swalwell’s apology.